As of January 27th, 2018 the game’s North American PlayStation Store page had not yet been updated to reflect the decision but all paid add-on content had been removed. The game had been completely removed from the Australian and European PlayStation Stores by this date. 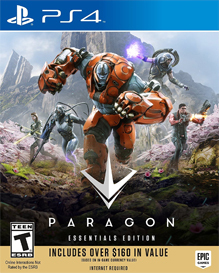 “Paragon is the MOBA from Epic Games that puts you in the fight with explosive action, direct third-person control, and deep strategic choice. Choose from an ever-expanding roster of unique Heroes, earn cards to customize their abilities, and lead your team to victory. • Instant access to Paragon.